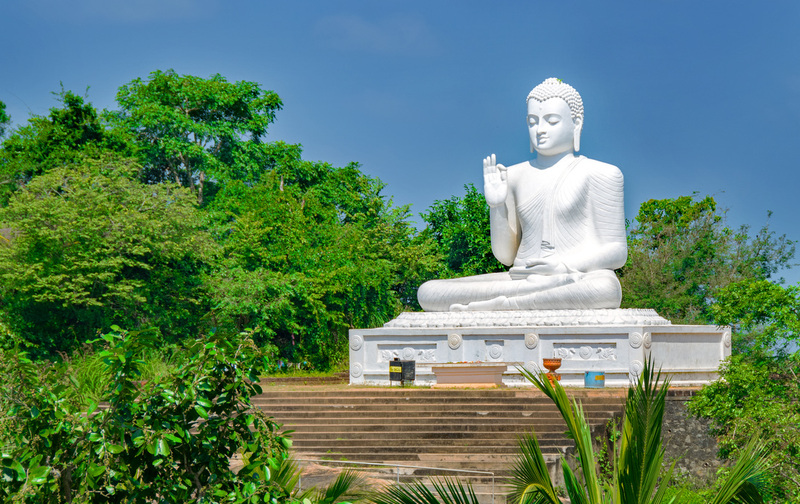 Located on the northern railway line 127 miles (205 km) from Colombo, the city of Anuradhapura is considered to be the northern apex of Sri Lanka’s cultural triangle. The sacred city of Kandy makes up the southernmost point, while the eastern city of Polonnaruwa completes this area of great historical significance. Located within the cultural triangle are five of the island’s eight UNESCO World Heritage Sites. With its abundance of accommodation options, many travelers will use Anuradhapura as a base to explore the triangle. A number of the most visited sites can be reached from Anuradhapura by utilizing a combination of hire cars, trains, buses or tuk tuks. 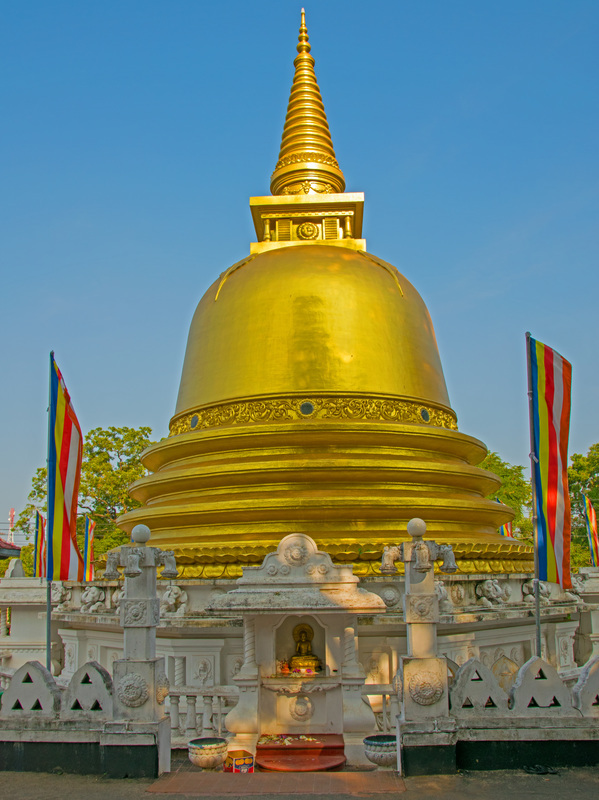 Anuradhapura was the capital and spiritual center of the island from roughly 300 B.C. until 993 A.D. At its height, 10,000 monks occupied the dozens of monasteries that were built in the city. In addition to the monasteries a number of enormous dagobas (stupas) were constructed which rivaled the Great Pyramids of Egypt. It was perhaps one of the greatest and most important cities of its age. In modern Anuradhapura, the ruins of many of these Buddhist monuments can be seen in what’s known as the Sacred City. This World Heritage Site contains some of the largest and most important monasteries such as Maha Vihara, Jetavana and Abhayagiri. The great dagobas are here as well. Tickets to the Sacred City are purchased at the park's entrance in the same building as the Archaeological Museum. It is strongly recommended to spend some time at the museum as it is quite good. The ruins of the Sacred City are spread out over a fairly large area and to see everything really requires the use of a tuk tuk or bicycle. This part of Sri Lanka can be incredibly hot. While touring the ruins it’s very important to drink plenty of water and use sun protection such as sun screen lotion, hats and long sleeve shirts. When approaching the dagobas and temples you will be required to remove your shoes as a sign of respect. The ground will often be very hot, so make sure to bring a pair of socks to protect your feet. ​Just outside the Sacred City are a number of other temples which are of great historical significance. 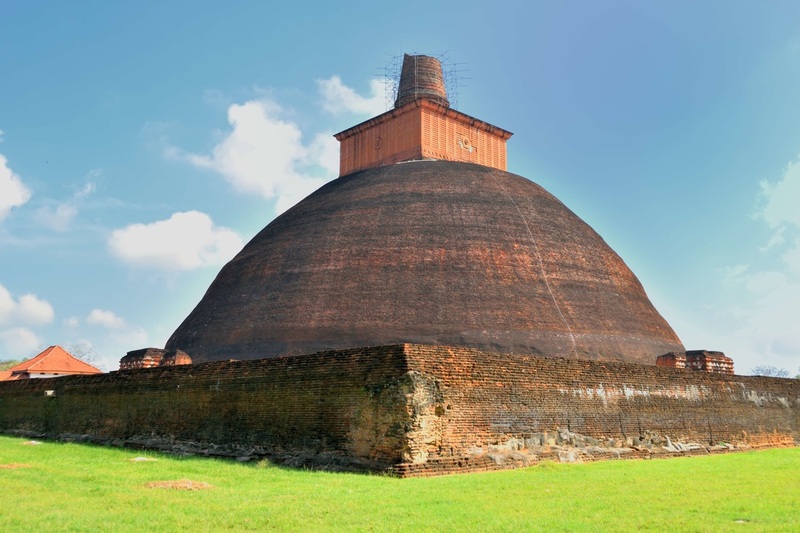 The Isurumuniya Vihara was built during the reign of King Devanampiya Tissa who ruled Anuradhapura from 307 to 267 BC. Originally built to house 500 young monks this site is built on an impressive rock formation. The rock’s caves were utilized as both places of worship and shelter for the resident monks. This site is also famous for its beautiful artwork, some of which is on display in a small museum on the grounds. 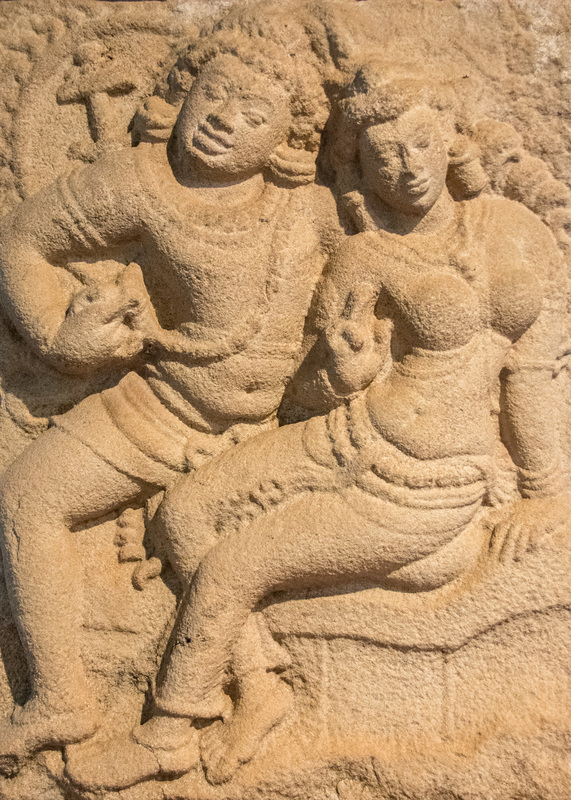 The most well-known piece is the carving of the “Isurumuniya Lovers” pictured above. Tradition holds the Gautama Buddha attained enlightenment while meditating under a Bodhi tree at Buddha Gaya in India. This tree, also known as Bo, Peepal or Banyan, is an important piece of Buddhist iconography. Legend has it that a branch of this particular tree was brought from India to Sri Lanka in 249 B.C. by Sangamitta Thera the daughter of the Indian Emperor Asoka. Planted in Sri Lanka by King Tissa, the ancient tree is a sacred relic revered by Sri Lanka Buddhists. The tree sits in the center of the Jaya Sri Maha Bodhi temple which is one of Anuradhapura’s most visited sites. Mihintale is a mountain and small town located eight miles (13 km) east of Anuradhapura. The mountain is named after the Buddhist monk Mahinda, son of the Indian Emperor Asoka, who had been sent to Sri Lanka to spread Buddhism. Legend has it that Mahinda taught, lived and slept on a slab of rock in a cave on the mountain top, known as Mihindu Guha. It was during this period that Mahinda met King Devanampiya Tissa and by 247 BC converted the king and his subjects. Sri Lankan’s long tradition of Buddhist practice started at Mihintale, one of Sri Lanka’s most revered sites. In addition to Mihindu Guha, the site has a number of shrines, dagobas and other Buddhist monuments. The mountain makes a great day trip from Anuradhapura and can be easily accessed by bus, tuk tuk, train or a combination of all three. Sigiriya, or Lion Rock in Sinhalese, is an enormous column of rock which had been the site of Buddhist monasteries from circa 300 BC. 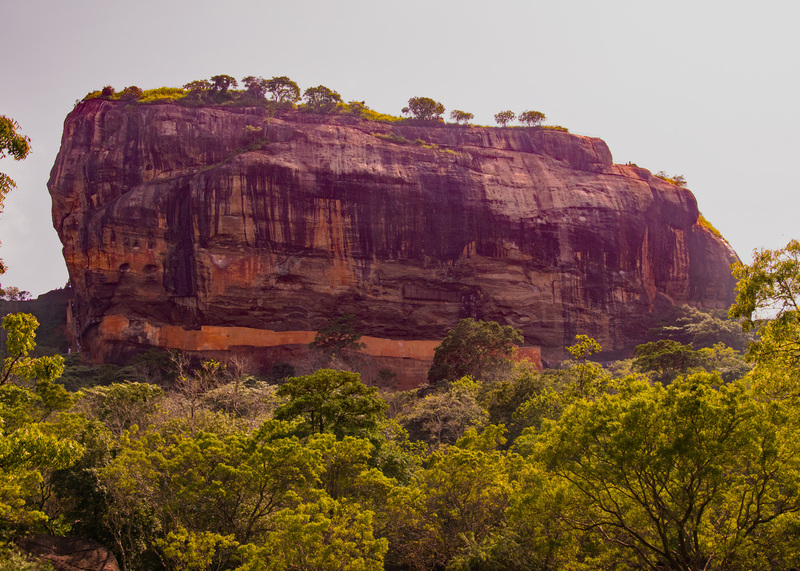 Legend has it that at the end of the 5th century AD, King Kassapa made Sigiriya the capital of his kingdom and built a palatial fortress on the rock’s peak, which towers 660 feet (200 m) over the heavily forested area below. The ruins of the kingdom can still be seen today, and with its spectacular view, many travelers consider a visit to this UNESCO world heritage site to be a highlight of their trip to Sri Lanka. There is much more to the site then just the ruins at the peak, which is essentially the center of the well-planned ancient city of Sigiriya. After purchasing an entry ticket ($15 USD), visitors are encouraged to spend some time at the museum located next to the ticket booth. This excellent museum provides a great deal of information on the history of Sigiriya and gives detailed explanations about the site’s many interesting features. Walking from the entrance towards the massive rock, visitors will pass through a series of moats and royal gardens which contain of a number of man-made pools and ponds used for water retention. The city’s ancient builders designed a clever hydraulic system which not only served a practical function, controlling water levels, but also created fountains to make the gardens a unique place of beauty. Following the path through the water gardens, visitors will begin their ascent to the top of Lion Rock via a series of terraces fashioned from large boulders. This area, known as the Rock Gardens, was the monastic center of Sigiriya; for several centuries Buddhist monks lived and practiced in the caves at the base of these terraces. Sri Lanka’s earliest cave dwelling monks often plastered and painted the interior walls of their simple shelters. The remains of this artwork, dating to circa 300 BC, can still be seen in many areas of the cultural triangle including Sigiriya, Anuradhapura and Kandy. 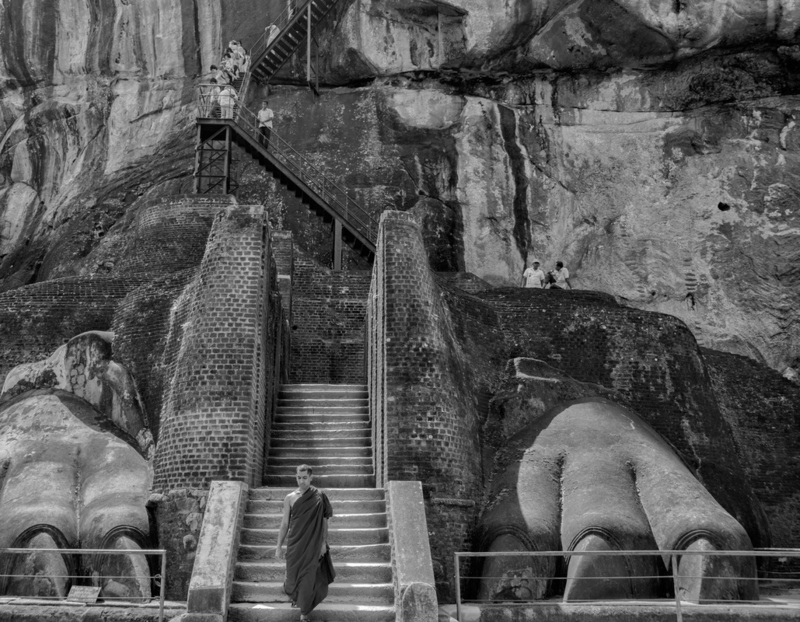 In the following centuries a number of cave temple complexes were created which featured large painted murals depicting images of the Buddha, Bodhisattvas and Hindu gods. One of the island’s most famous examples of cave painting are the frescos known as the Sigiriya Ladies or Sigiriya Damsels. Scholars disagree on whether the ladies represent goddesses, Bodhisattvas, apsaras or women of the royal court. It is believed that the sheer face of the western side of the rock was once covered with 500 paintings of beautiful young women. Almost all of these remarkable works have disappeared since they were first created sometime in the 5th to 6th centuries. The remaining 21 frescos can be seen in a series of caves, the next stop on a tour of Sigiriya, which are accessed by a series of walkways and a spiral staircase. After viewing the frescos, visitors will walk along a pathway alongside a section of the rock face known as the Mirror Wall. Originally this section of Sigiriya was covered in plaster, which like the majority of the Damsels, disappeared centuries ago. This rock appears to be highly polished, hence the name, Mirror Wall. The wall is covered in “graffiti” carved into the stone by visitors to the site, the oldest of which dates back to the 7th century. The presence and content of the graffiti indicates that site and the frescos were well known and visited centuries after the Sigiriya ceased to be the kingdom’s capital. The next stop on the journey to the peak is a rock outcropping known as the Lion’s Gate or Lion Platform. Here visitors will encounter the final stairways to the remains of the fortress at the top of Sigiriya. The first staircase is situated between two enormous stone lion paws. This is one of the site’s most iconic images, most likely created to remind ancient visitors that the king held great power. At this point many visitors will opt to take a rest and admire the fantastic view. Climbing Sigiriya is tiring; to make the journey up and down the rock and see the points of interest will take two and a half to three hours. It’s highly recommended to start the visit early in the morning to avoid the mid-day heat as much as possible. Unlike most heavily visited tourist sites in Sri Lanka there is no place to purchase food or beverages in the park itself. Please remember to purchase plenty of water before arriving at the site. Another popular destination in Sri Lanka’s cultural triangle is the Dambulla cave temple also known as the Golden Temple of Dambulla. The complex, a UNESCO world heritage site, is composed of five caves situated on Dambulla rock. These are the best preserved cave temples in all of Sri Lanka and feature stunning wall murals and several massive reclining Buddha images carved out of Dambulla rock itself. The site has been used by both Buddhists and Hindus as a place of worship since 100 BC. The distance between Sigiriya and Dambulla is roughly 10 miles (17 km) so it is very easy to cover both of these sites in one day. As previously mentioned, it is advisable to visit Sigiriya early in the morning to avoid the mid-day heat as much as possible. This leaves the afternoon free to visit Dambulla, which can be seen in a couple of hours. Sigiriya is located forty miles (64 km) from Anuradhapura, or 36 miles (58 km) from Polonnaruwa. Travelers staying in either of these cities can hire a car and driver to visit both places for around $50 USD. It is also possible to do the trip by bus from Colombo or any of the major cities in the cultural triangle. There is really nothing to see in Dambulla besides the cave temples. Many visitors to the area will opt to stay at one of the guest houses located near Sigiriya and take a bus or tuk tuk to Dambulla.